Meet Janet Haley, Associate Professor of Theatre! Classes I teach: Directing, Acting 1, Improvisation, Voice and Movement, Dramatic Literature, Senior Seminar; Advisor for Acting and Directing Capstone projects, Coordinator of BFA in Performance degree program. 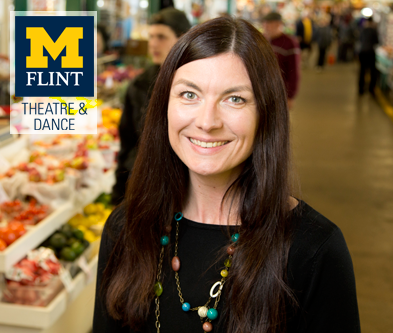 • Director/co-creator of place-based, collaboratively created, original productions (public scholarship): 2010’s “Glen-wood” The Glenwood Cemetery Site-specific Theatre Project (Flint); 2014’s “9xNourished” at the Flint Farmers’ Market, with Flint Youth Theatre. Note: This type of civically engaged art making is theatre made with and for community. • Actor: Michigan Shakespeare Festival, including: Portia in Merchant of Venice, Beatrice in Much Ado About Nothing, Gertrude in Hamlet, Titania in Midsummer Night’s Dream, Paulina in The Winter’s Tale, Constance in King John, Portia in Julius Caesar. • Director: University of Michigan-Flint Department of Theatre, Main season productions of Metamorphoses, The Cherry Orchard, A Midsummer Night’s Dream, The Women of Lockerbie, Moliere’s The Learned Ladies, The Ash Girl, The Lieutenant of Inishmore, and Master Harold and the Boys by Athol Fugard. • Upcoming: Will perform in Flint Youth Theatre’s production of Diary of Anne Frank in Spring 2015; Will perform with Michigan Shakespeare Festival, summer 2015, in THE RIVALS, HENRY IV Parts 1 and 2, and A Midsummer Night’s Dream. Directing Eurydice at UM-Flint, Jan/Feb 2015. Collaborative/ensemble-created performance projects, using interdisciplinary methods, as well as improvisation and collective dialogue. Site-specific / place-based performance for the purpose of engaging people with places and each other in a community. Advocate/contributor to the developing alliance between UM-Flint Department of Theatre & Dance and Flint Youth Theatre. Awards: Faculty Fellow, Arts of Citizenship, UM-Ann Arbor 2010; Boyer Fellow in Public Scholarship, UM-Flint; 2011 Heritage Award, given by Genesee County Historical Society for the Glenwood Cemetery Site-specific Theatre Project; numerous nominations for performance from Michigan professional theatre’s Wilde Awards, including Best Actress in a Comedy (Tartuffe), Best Actor in Shakespeare (The Winter’s Tale). I directed Master Harold and the Boys by Athol Fugard in 2002, and it was invited to perform (and did perform), at the Kennedy Center’s American College Theatre Festival, Region III’s 2003 Festival in Indiana. This was one of 5 productions picked to perform at the region festival from the 5-state region. • MFA in Acting, The University of Texas at Austin, 1996. • BA (double major) in Theatre, English, University of Michigan-Flint 1991. • Alumna of Cornerstone Theater, Los Angeles, Summer Institute in Community-Engaged Theatre 2010. I never wanted to be famous. I just wanted to make Theatre that was full of beautiful things, exciting things, fun things, important things, WITH PEOPLE and for people. I grew up in Flint public schools, and was involved in the “Magnet Programs” for the arts and humanities in grades K-12. I was a student at Flint Youth Theatre. I danced for 8 years. I played the piano for 8 years. In school, I was always making things with my peers – plays, concerts, poetry. Indoors and outdoors – nature was very important to me – places in nature and the outdoors. I liked making things that told stories and made us feel and think. At home my father and mother liked to have conversations with us; talking about our world, the news, our dreams, our thoughts and feelings about our experiences. My grandmother was a great storyteller, and all my elders were patrons of the arts. Conversation, learning for learning sake, the arts, places, and making and sharing things with people were primary values in my growing up years…and still are today. My senior year of high school at Flint Central, my drama teacher insisted I audition for a theatre scholarship at UM-Flint…I was planning on going into nursing; I never thought I could actually make a living making theatre. I was awarded a 4-year scholarship in Theatre…and my life’s course was changed. Carolyn Gillespie, UM-Flint Professor Emerita of Theatre, was my Theatre professor at UM-Flint, and my mentor. I wanted to make powerful experiences in Theatre with students and for our Flint community. As I proceeded to my MFA professional actor training at UT-Austin, and had a career as an employed actor in Theatre, I had it in my heart I wanted to return to UM-Flint, to make Theatre with and for Flint. I hope to continue to work in the realm of engaging the arts and humanities programs of UM-Flint with the community beyond the campus boundaries. I hope to work toward developing civically engaged courses, deepening civically engaged curriculum elements that are inclusive of physical places within reach of our campus landscape, as well as students and community members from a multiple disciplines and perspectives. Celebrating diversity is a primary value in my creative activity endeavors – engaging diverse perspectives, experiences, backgrounds, ages, genders, cultures, etc., in making Theatre experiences with and for the communities UM-Flint serves. I hope the students I work with hold on to the values of collaboration, willingness, positivity, and imagination by doing and sharing with others. I hope their experiences with the wide variety of narratives that Theatre provides inspires them to live their lives mindfully, empathically, creatively, and with kindness to others. I hope that students gain from the process of making live performance can ignite their wellness and capacity for communication and compassion; it can deepen their value of real time exchanges; it can cultivate a value and need for 3-D experiences in physical places (on stage and in their communities), balancing the pull of the solitary “digital life” of the internet, social media, and “the screens on our laps and in our hands.” I hope live performance experiences help people feel well, empowered, and connected to the pulse in their lives in the 3-D world. • I am ignited by finding the opportunities in the obstacles. • I believe that finding solutions and choices together is far superior to the plan in any one person’s head. • I embrace the creatively constructive potential in the chaos of YES. 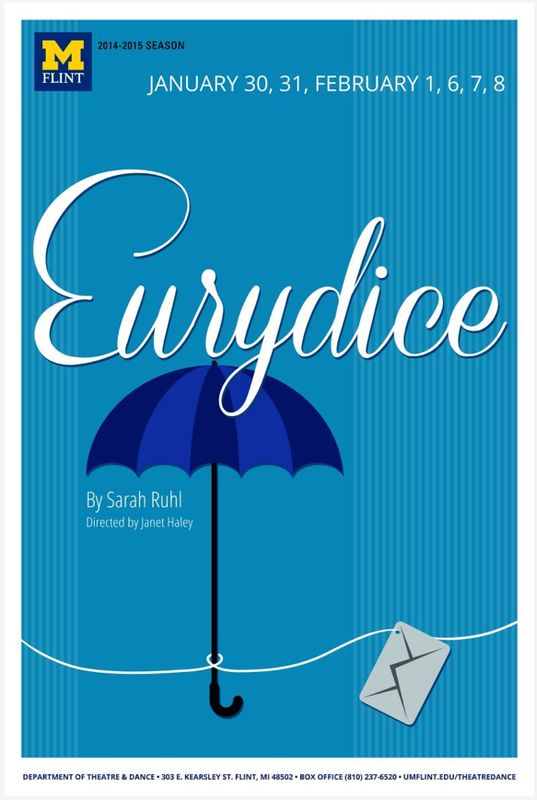 See Ms. Haley’s work at the upcoming production of Eurydice opening January 30th at the UM-Flint Theatre! Visit the Theatre & Dance website for more info! January 27, 2015 Comments Off on Meet Janet Haley, Associate Professor of Theatre!